“What a waste!” She complained. “I rinse the dishes, load them, then unload the dishes. Madness! In the time I did all this, I could have just washed them by hand and be done with it.” My mother’s rant focused upon the dishwasher my father presented to her — a Mother’s Day surprise. But when life’s difficulties intervened, her true self emerged: the pragmatist and survivor who possessed boundless courage. Three days before she died, my mother, Seren Tuvel, gave me the only knick-knack she ever displayed in her dressmaking salon. At 65, she was slipping away from me, perched on that ethereal divide between life and death, frail as a fledgling swallow facing a powerful gust. Her Knick-knack: a wooden box painted to resemble an antiqued book. Within its covers, the poignant message printed in flowing script upon a background of Renaissance angels. 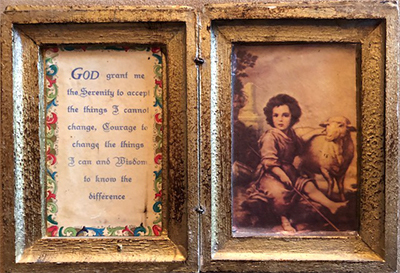 “God grant me the serenity to accept the things I cannot change, courage to change the things I can, and wisdom to know the difference.” The Serenity Prayer, Reinhold Niebuhr. All content Copyright 2018 Marlene B. Samuels • Content may not reproduced or distributed without permission of the author. For inquiries please visit our contact page.